One of the fastest growing trekking routes around Manaslu Conservation Area, Manaslu Circuit Trek offers all the elements that other trekking region offers in Nepal. Suspension bridges, greenery hills, beautiful rivers, culture, and tradition of people inhabitants from the sub-tropical regions to high Himalayan regions, diverse flora and fauna, protected wildlife, high mountain passes, dramatic landscapes, Buddhist monasteries and many more. After building tea houses at the overnight destination in Manaslu Region, trekking to Manaslu became more popular among backpackers. Even though, it is less crowded and virgin destination for trekkers. It can be also considered as the peaceful, filled with naturally fresh air, and culturally riches alternative trekking route for Annapurna Circuit Trek since most of the walking trail of the regions have been replaced by a motorable road. Magnificent view of the eight highest rocky peaks in the globe, Mount Manaslu (8,163 m) is the jewel of Manaslu Circuit Trek. Similarly, Ganesh Himal, Himalchuli etc are other white mountains above 7000 meters covered in this hiking. 2000 species of plants, 33 mammals, 110 birds, 3 reptiles and 11 butterflies, 11 types of the forest has been found in this region. Your journey to this wonderful trekking route "Manaslu Circuit Trek" begins from Gorkha District at Sotikhola (crossing Arughat), 7 to 8 hours driving distance from Kathmandu. Walking through the side of the gorge of Budi Gandaki River, you will be crossing several small villages like Maccha Khola, Jagat, Deng, Namrung finally reaching Samagaon, the residence of several Nuns and Monks. Lots of holy Buddhist Monasteries are founded here. After proper acclimatization and walking 6/7 hours per day, on the eleventh day of this trek, the challenging high pass, Larkya La Pass (5,160 m) will be crossed and the trail descends down to Bhimtang Village, Dharapani, Jagat and exiting the trek from Bhulbhule. You will be driving back to Kathmandu. The exit point of this trek is the entry route for Annapurna Circuit Trek. Manaslu Circuit Trekking route is the restricted trail of Nepal. To enter in this area special permit is required to collect first. Without the permission, entering here is strictly prohibited. Trail Attractions: Trisuli River, terrace fields etc. Max. Altitude: 710 m (Sotikhola). Day 02: Trek to Machha Khola. Day 04: Trek to Deng. Max. Altitude: 1,804 m (Deng). Day 05: Trek to Namrung. Day 06: Trek to Samagaon. Day 07: Visit Pungyen Gompa. Day 08: Trek to Samdo. Day 10: Trek to Dharmasala. Day 11: Cross Larkya La Pass & Trek to Bhimtang. Day 12: Trek to Dharapani. Day 13: Trek to Jagat. Day 14: Trek to Bhulbhule. Drop to your hotel. Manaslu Circuit Trek finished here! 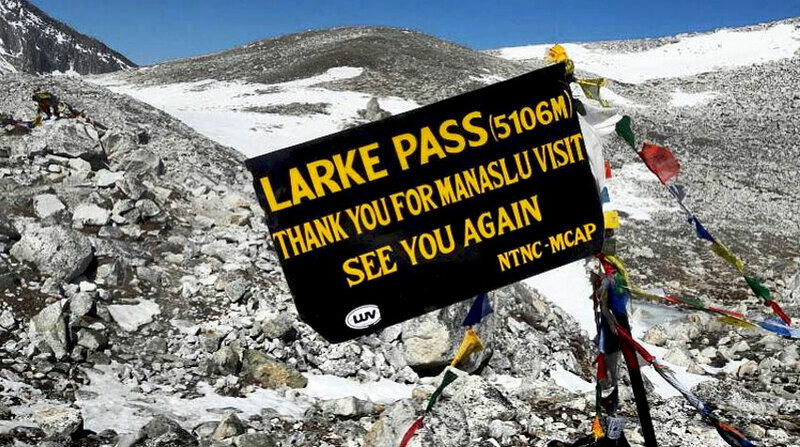 Wants some modification on Manaslu Circuit Trek itinerary? contact us to customize it.